I know that the April rain has been dreary but with summer just around the corner, I am sharing a few quick ideas on how to make your corporate summer picnic fresh this year. I am in Niagara Falls and Niagara-on-the-lake for several site inspections for upcoming summer and fall events. I promise to share all the good happenings in the area on a future post. I also want to send out a huge CHEERS and THANK YOU to the aNd team and all the venues and suppliers from our nominated events - we have 4 events nominated this year! Good luck to all the talented event industry professionals across Canada. I can excuse many things when it comes to politicians and I have never been one to judge people on their “recreational activities”. However last week’s flag follies at City Hall were ridiculous. The flag debate erupted last Friday, when the mayor found out that a rainbow-coloured flag had replaced a City of Toronto flag on a courtesy flagpole used to display the flags and banners of a range of organizations. Councilors started to chime in - some in support and others on what they thought should take its place. This frat house maneuver just didn’t work mainly because it was not displayed correctly. It should have be suspended vertically with the stem on the right when viewing it from the street I love this shot from the National Post Good thing the mayor and councilors don’t have the “power” when it comes to flying flags – Protocol at City Hall is strong and holding firm to preserve the dignity our national flag deserves. Lucky for us here in Canada, we have been seeing quite a bit of our flag at the Winter Olympics. So what better time for event planners everywhere to review some flag etiquette and keep our flag flying with pride. The final firework has fizzled, and the show is over! The aNd team watch it together and though it wasn’t as long as you would imagine when the ceremony consisted of 18 chapters covering 1,000 years of Russian history with 3000 performances. Here are a few of our highlights. My favorite - the shear engineering of "The Building"
The $600 million building designed to house it all is Fisht Stadium. Though Fisht is the primary stadium for the games themselves, its designers—the US-based sports venue architects at Populous and structural engineers at Buro Happold—designed it so that it could offer "studio conditions" for the opening ceremonies. That means the translucent polycarbonate roof will not only give the building an appearance of snowy peaks, ensuring it sits in harmony with the landscape of the Imeretinskaya Valley and the Caucasus Mountains, but this roof can be used as a screen for projections, as well as massive hangars at each end that will be used as staging areas for the thousands of athletes and tons of equipment that must be moved quickly into the arena. Opening ceremony - the pyro technicians have been rehearsing the fireworks for days. 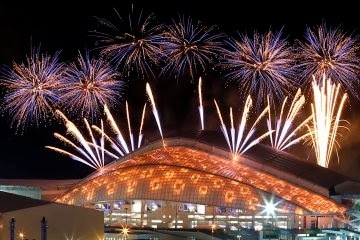 Fireworks over the Fisht Olympic Stadium at the Olympic Park during a rehearsal of the opening ceremony in Sochi, on Feb. 4, 2014. 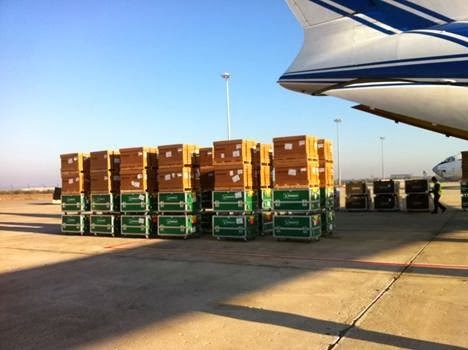 Solotech (a production company in Montreal) lands in Sochi with one of the biggest projection systems in the world. 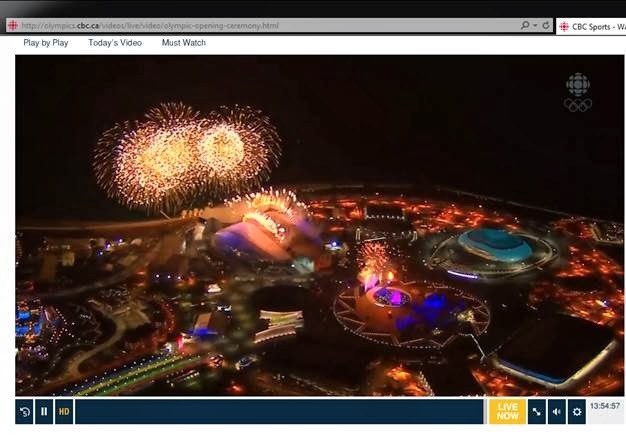 They are handling the video projections for the 2014 Sochi Olympic Games. Does anyone see any snow? This is the 2014 Winter Games! Known as the Russian Riviera, the Black Sea resort of Sochi is the warmest city ever to host the Winter Olympics. Canada’s presence at the 2014 also includes Quebec’s world-famous circus act Les 7 Doigts de la Main, a troupe with previous Olympic experience, was involved in a 10-minute performance immediately after the athletes’ entrance into the Stadium. Our eagle eyes noticed that one snowboard sculpture refused to light up. 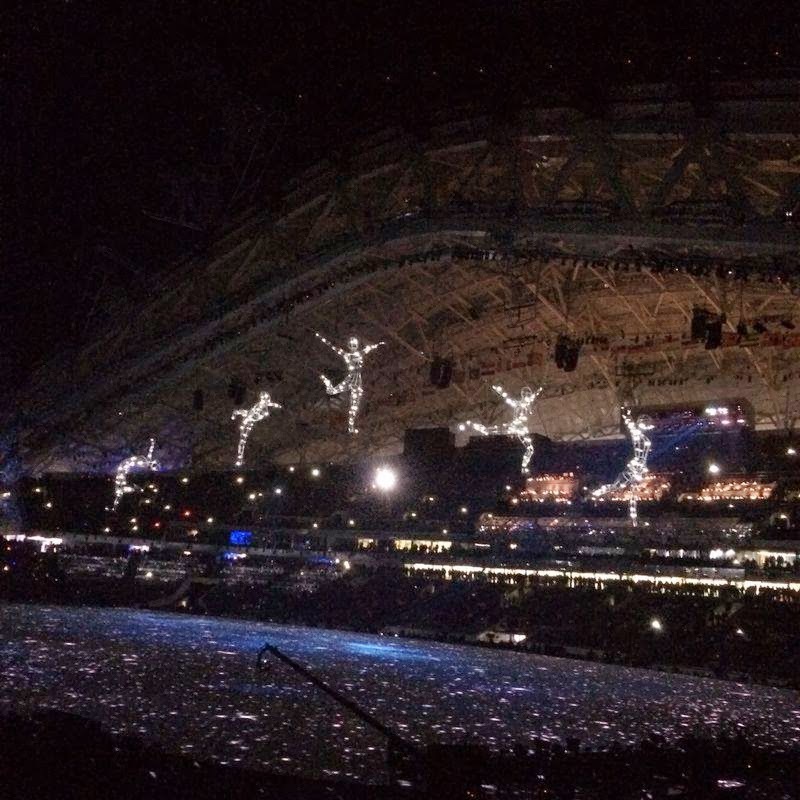 What a great way to exit into the games with the lighting of the Olympic Cauldron into the Musical Firework finale with Tchaikovsky’s Nutcracker. The Olympic stadium grounds were built with great thought and care, that filmed from a bird’s eye view, Sochi looks like an Olympic Nation. It's cold out there and while temperatures are plummeting, I thought I would share some ideas on how to thaw the ice and get your own office staff or meeting attendees to warm up to each other. From time to time clients and colleagues have asked me for suggestions for games to refresh attendees, get them energized, ready to work and into a collaborative mind set. This one is very simple and works well for drop in hospitality rooms or casual settings where attendees are arriving at different times. Put out the playing cards of a Trivial Pursuit game where guests will easily see them. People will automatically start reading the questions to one another instantly and naturally engage in conversations with one another. Tape a piece of paper with the name of a person, place or thing on the back of each participant, but don't let them know what the paper says. Have attendees mingle around asking each other questions about the word on their back. They can’t directly ask what the word is – they can only ask for hints. This is a great game to refresh people and get them talking to each other. Break people into small groups at a volunteer meeting or first gathering of a volunteer board and give each person a penny. Ask them to introduce themselves to the group and talk about what they were doing during the year on their coin. This activity is a mini scavenger hunt which doesn’t require a great deal of space or preparation. Participants hunt through their pockets, purses, wallets and briefcases. Organize attendees into groups of five to ten. Explain that they may make a reasonable substitution, but if they do, that item will be worth less. For example, someone may have an Aeroplan card rather than an Air Miles card. After 2 minutes, ask groups to count their points. Ask groups to share what items they got from the list and which substitutions they made. A la Tom Cruise, teams mix up their own cocktails, collaborating to win the tastiest and most attractive concoction from a range of identical ingredients. (Think reality shows like the Cocktail Chronicles or Battle Mixology). Make fruity virgin versions for meetings where alcohol may not set the right tone. If this week’s Golden Globe nod and Oscar nomination are any indication of success then it looks like AMERICAN HUSTLE is the movie to watch and transform into your next great event. AMERICAN HUSTLE is an enhanced return to a popular 70’s theme event. From the fashion to the furniture to the funky music the movie offers some bright ideas for event elements. For lounge furniture – white, white and more white but try paten white – this glossy option adds a fresh twist. Embellish your table settings with a luminescent glow using golden-threaded organza linens then add sequins, chrome lamps, embossed menus and even faux fur. The 70’s may evoke images of harvest gold and chocolate brown but strong vibrant colours like turquoise also play into the mix. Be brash; be bold, and over-the-top! For music options, start the reception with classic rock cuts from ELO, Elton John and Chicago then elevate the energy at the after party with some Donna Summer dance classics at a Studio 54 re-enactment. Food inspiration - any Italian menu would connect to the plot of this crime drama set in New Jersey and for a little fun don’t forget to add a simulated pill popping candy bar for dessert. Looking for other movies that offer creative themes? Look at the films that are nominated for best cinematography or animation. These stunning motion pictures offer plenty of substance for creating out-of-this-world environments. GRAVITY - an AV manager's greatest fantasy creating a 360-degree outer space atmosphere. You can go starry-night elegant or retro sci-fi. Plus an icy luge of Russian Vodka is the perfect feature for your Bar. FROZEN - a fantasy landscape of sparkling ice, shimmery fabrics and glittery lights. Crystals, icy blue fabrics, and snowflake patterned gobos are just some of the templates that can be used to create this FROZEN theme event. Use these elements to layer the look as much as you can. And if you don’t want to commit yourself to the whole theme try just a frozen dessert station featuring liquid nitrogen frozen drinks and ice cream bars. This weekend – watch a few movies! My husband and I started off the New Year braving the cold and snow at the NHL Winter Classic in Ann Arbor. Huddled in the trenches of the Big House with 105,000 frosty hockey fans, we had no regrets on our decision because it was truly a once in a life time experience. Though I have always promoted sporting events as a team builder, my day at the Winter Classic really made me understood what it meant to bond with the crowd (even though they were strangers) we quickly connected on several levels because of our shared experience. And we all know that it is the “experience” that provides that biggest ROI. Now if it’s something big you had in mind (think Super Bowl or perhaps the Indy 500 or the Masters) for your highest producers and most important clients, the event will guarantee your award recipient will enjoy a sports experience they won’t soon forget and if you go as a group - expect to grow closer to the people you go with. Many of these iconic events have well deserved reputations earned over the years because of the magnitude, exclusivity (limited availability) and tradition that goes with the event. Take our Winter Classic experience; the enormity of the event and everything associated with it from the pre-game activities like tailgating, the kids playing hockey on the back pond during intermissions to all of the dancing in the stands to keep warm and the high fives with total strangers when the Leafs scored made it an experience that you just have to be a part of and most importantly, will be envied by everyone who watched it on TV. On a smaller scale, finding the perfect sporting event to motivate your employees or say thank you to your clients locally isn’t difficult; especially here in southern Ontario where the sports franchises are abundant (regardless of the fans being loyal or fickle). You don't necessarily need the comfy confines of stadium/arena suites or private boxes for a sports event to be memorable. And it doesn’t have to be a group activity either. Sitting in the thick of things with everyday fans, enjoying a hotdog with a beer and box of popcorn with friends/colleagues, can be just as much fun. Make sure to include an extra ticket or two so a friend, family member, or significant other to make the experience more enjoyable. Most people don’t want to watch the game alone. Programs, souvenirs and autographed memorabilia are a great way to enhance the experience. My "go to" sports guy is Atiq Ahmed from Maple Leaf Sports +Entertainment. Atiq keeps me in the know on what is happening on all things sports including soccer. He tells me that we’ll start to hear much more about Toronto FC in the news – they are doing big things for this upcoming soccer season. BTW – I am using the new Pantone Colour of the year - RADIANT ORCHID. The hue which is a perfectly blended mix of purple and pink is so versatile. Pantone suggests using an RGB of 200/107/168 but I went a little lusher using 162/60/128. And don’t be surprised to see this colour (or shades of it) easily paired with many other colours and patterns for décor options this year – think rich browns, radiant blues, animal prints, metallics and even red. You can’t help but feel happy setting your eyes on this fantastic colour...even on this dull and dreary January day it will make you smile.